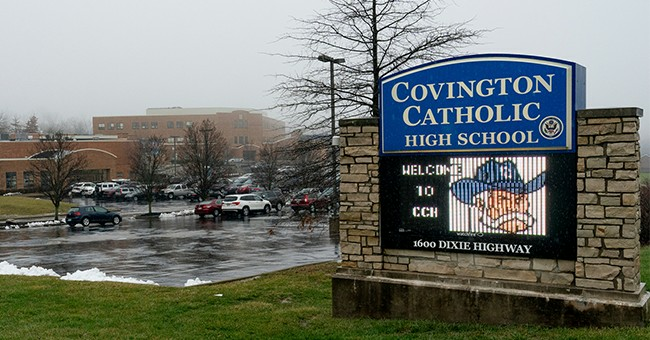 Covington Catholic Principal Bob Rowe closed school on Tuesday in the wake of this weekend's controversy. The media tore into student Nick Sandmann after a video suggested he had harassed a Native American veteran, Nathan Phillips, at the Lincoln Memorial. When more footage came out, it turned out Sandmann had done nothing wrong. New videos show that another group, the Black Hebrew Israelites, were shouting obscenities at the Covington students and that Phillips first approached the Catholic students, not the other way around. Still, the media damage had been done and critics started calling he and some of his peers "racists" and some even started receiving death threats. Aware of these safety concerns, Rowe met with local authorities to assess the situation, before calling parents to tell them all classes and school activities had been cancelled. They should "not to be on campus for any reason," he said, asking parents to "keep the Covington Catholic Community in your prayers." Before all the additional footage and context came out, Covington had condemned the actions of its students. "We condemn the actions of the Covington Catholic High School students towards Nathan Phillips specifically, and Native Americans in general, Jan. 18, after the March for Life, in Washington, D.C. We extend our deepest apologies to Mr. Phillips. This behavior is opposed to the Church's teachings on the dignity and respect of the human person. The matter is being investigated and we will take appropriate action, up to and including expulsion. We know this incident also has tainted the entire witness of the March for Life and express our most sincere apologies to all those who attended the March and all those who support the pro-life movement." Yet, Sandmann and some classmates who served as witnesses rejected the whole premise. In his own strong statement, Sandmann was adamant he was not harassing anyone at the march. "I was not intentionally making faces at the protestor," Sandmann explained. "I did smile at one point because I wanted him to know that I was not going to become angry, intimidated or be provoked into a larger confrontation. I am a faithful Christian and practicing Catholic, and I always try to live up to the ideals my faith teaches me - to remain respectful of others, and to take no action that would lead to conflict or violence." Phillips rejected Sandmann's statement, demanded he write a new one, and suggested he and his peers be considered for expulsion. "He didn't accept any responsibility," Phillips said. "That lack of responsibility, I don't accept it." In related news, Phillips has reportedly turn down an opportunity to sit down and meet with a group of Covington students. Cincinnati restaurateur Jeff Ruby offered to host the meeting, hoping the parties could "break bread" together. "It's not the right time," Phillips told The Cincinnati Enquirer. "I might consider it at some point. There'd have to be certain assurances in place, give and take, and understanding." Covington plans to have a safety plan in place upon the students' return. How sad the school has to take these drastic measures because the media ran with a narrative that was way off base.